Standard - €8.99 Only 1 left! Sometimes in the summer you want to make a great fashion statement with a cool pair of tight gloves but it can be so hard to use your fingers well when they are trapped even in the thinnest of fabrics. On top of that it can get a little too warm and nobody wants to be around someone with sweaty hands. Maybe it's time to once again get a little help from the innovative fashionistas from the 80s and grab a pair of fingerless gloves. Now we've got the best of both worlds! 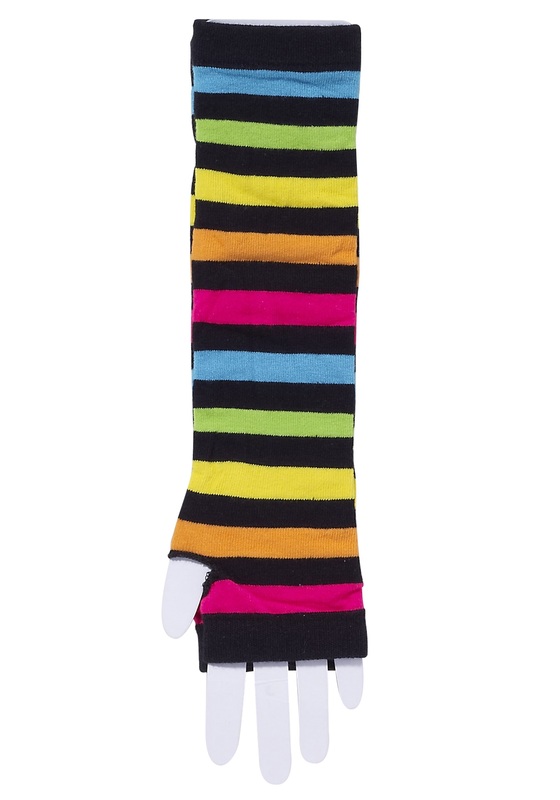 Rock out with these 80s Rainbow Striped Gloves and bring a little more color to your 80s costume. Not looking to dress like your parents? These still make some sweet punk rock gloves that you can wear on your next trip to a Warped Tour concert. The black makes for some sweet contrast with the bright rainbow colors that goes with everything grungy or punk.